Lassen High School’s Future Business Leaders of America attended the Sectional Leadership Conference in Elk Grove Feb. 8-10. The conference was hosted by Cosumnes Oaks High School and the lunch was served and cooked by their culinary program. 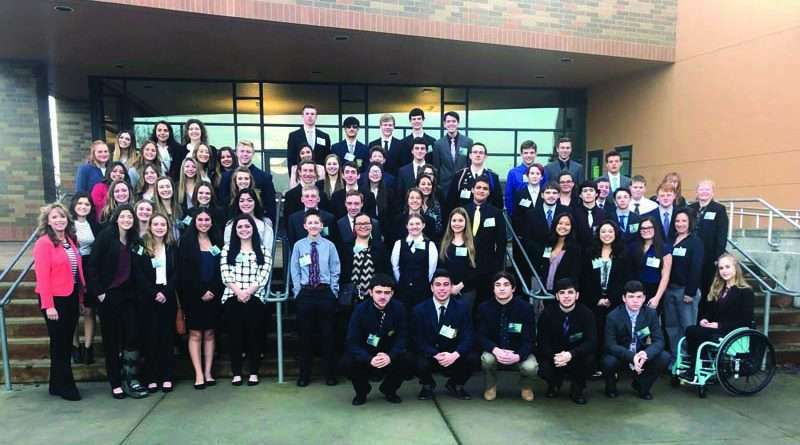 Students competed in more than 75 competitions during the day, the following students placed in the top 10 and qualified to attend the State Leadership Conference in Ontario, California in April. Agriculture Business – Sterling Chandler (third) and Jack Mallery (sixth). Broadcast Journalism Team – Autry Satica, Gaige Thompson and Ronnie Merrill (third). Business Communications – Emma Newton (sixth). Computer Applications – Sean Longabaugh (fifth). Computer Problem Solving – Bryson Mays (first). Cyber Security – Emily Lopez (sixth). Database Design and Applications – Caitlyn Crosby (first). Global Business Team – Jayleih Dodge, Cinthia Tiffany and Ellie Stewart (fifth). Healthcare Administration – Logan Ernaga (first). Hospitality Team – Shassi Wengu, Bria Uribe and Hailey Moore (sixth). Introduction to Business – Jacob Daniels (first) and William Beterbide (fifth). Introduction to Business Communication – Beth Nielsen (first) Alliyah Yerington (sixth). Introduction to Information Technology – Zak Mallery (fourth). Management Decision Making Team — Emma Newton, Gabe Delgado and Leif Newton (first). Marketing – Ethan Heffner, Jake Wilburn and Dom Sullivan (fifth). Sales Presentation – Taylor Greer (first). Securities and Investments – Carson Ellena (first) Aiden Phillips (fifth). Spreadsheet Applications – Kristen Skillen (first), Hailey Moore (fifth) and Anna Geoia (fourth). Word Processing — Trenton Morgan (second).. Global Business Team – Jayleih Dodge, Cindy Tiffany and Ellie Stewart (fifth). Parliamentary Procedure Team – Tatiana Munoz, Trysta Spangle, Cole Dyer, Sean Longabaugh and Baylee Tinnin (third). Sports and Entertainment Management – Brand Satica, Tyler Schwagel and Aiden Phillips (first). The advisors offered congratulations to all of the students who practiced and attended the conference. Lassen High School placed third overall out of 500 students attending. The sweepstakes award is a sign of their hard work and dedication to business and professionalism. Students will be fundraising to help pay for their way for travel and expenses at the state level. Advisors Dawn Egan, Kerrissa Schall, Carrie Satica will attend state to support the competitors.